Norwich City have signed West Ham United midfielder Matt Jarvis and Dynamo Kiev striker Dieumerci Mbokani on season-long loans. Jarvis, 29, made 90 appearances for the Hammers after joining in August 2012. 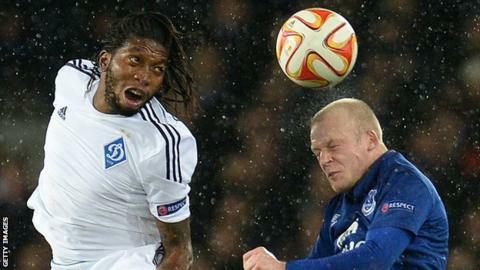 The Canaries have an option to buy Mbokani, who is a 29-year-old DR Congo international. "He's a big, strong number nine," said City manager Alex Neil. "He can take the ball in, he's mobile and he's a real threat in the box." Meanwhile, Ricky van Wolfswinkel, 26, has joined Real Betis on loan. The Dutch forward signed for Norwich from Sporting Lisbon for a club-record fee of £8.5m in July 2013 but scored only one Premier League goal as the club were relegated from the top division and he spent 2014-15 on loan at French club St Etienne. And midfielder Bradley Johnsonhas left the club to sign for Derby for £6m. "I have mixed emotions about Bradley Johnson's transfer to Derby: he was outstanding for us last season, but I think he'd struggle to match that form in the Premier League, especially with the competition in midfield. "We've brought in Dieumerci Mbokani from Dinamo Kiev on loan, of whom I know nothing about and Matt Jarvis from West Ham - not on many City fans' wish lists, especially after some of the names we were linked with. No centre back though."